Type: BOOKS. Detail: Gershon & Nor. Product Code: 9789197600521. A chess classic! 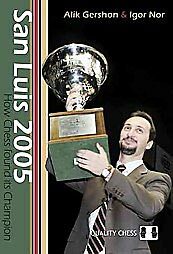 San Luis 2005 is the most celebrated chess tournament of the decade. Bulgarian Grandmaster Veselin Topalov triumphed and proved that he is a worthy successor to World Champions such as Bobby Fischer and Garry Kasparov.Tournament books used to be a familiar part of chess literature with Zurich 1953 a classic example, however such books are now rare because of the huge effort they demand from the authors. Gershon and Nor have risen to the challenge and produced a book that is destined to become a modern classic, a magnificent book worthy of an extraordinary tournament. Many color photographs of the event and the surrounding Argentinean scenery help the reader feel what it was like to be at San Luis 2005.